The girl who had the entire city cheering for her as she advanced to become a finalist on the “Voice” was honored with separate citations from the mayor and the council on Tuesday night. 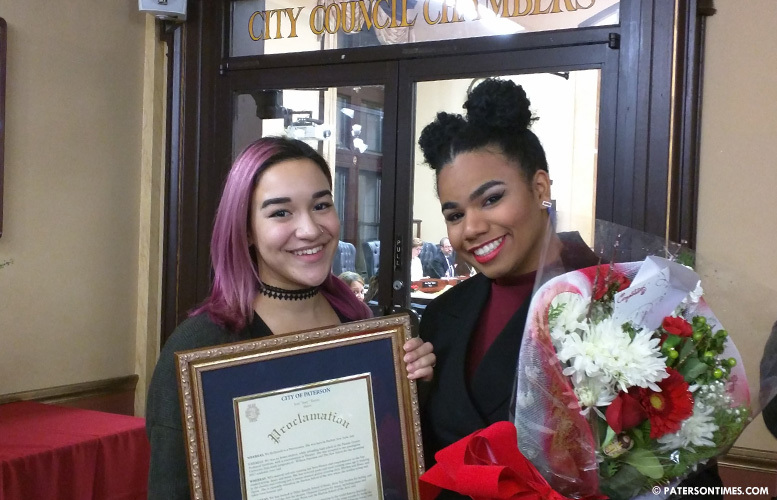 Her best friend from high school, mayor Jose “Joey” Torres’ daughter Joely Torres (pictured, left), read out a list of her achievements so far in life and handed Wé McDonald a framed proclamation on behalf of the mayor. “Thank you for all the love and support. I really wouldn’t have gotten through those weeks and days and hours without it,” said a wonderstruck McDonald, 17 (pictured, right). She sang “Hallelujah” in her trademark voice that made her a finalist to sustained applause and loud cheers inside the city council chambers. “Amen to that. Welcome home. Welcome home Wé!” remarked Torres after her performance. He declared December 20th, 2016 “Wé’s Day” in Paterson. McDonald attended the Passaic County Technical Institute where she became close friends with the mayor’s daughter. She studied theater at the Wayne high school. She was accepted to the jazz programs at William Paterson University and the New School. She opted for William Paterson University. Even before she got on the “Voice” she was enrolled at the Harlem School of Arts through which she performed at renowned venues like Carnegie Hall, the Lincoln Center, and the Apollo Theater. She won twice and was placed second twice at the amateur night at the Apollo. McDonald became the youngest person to be placed in the adult category at the Apollo in Harlem. McDonald, who finished third on season 11 of the “Voice,” has collected millions of fans. The talented young performer from Paterson is destined for a great musical future. “Paterson is proud of you!” remarked councilman Andre Sayegh. He urged her to fight against bullying. “One of the compelling aspect of your story is you were picked on. To all the bullies out there, look at her now,” he said. The mayor said McDonald will be putting on a concert at the Shea Center for Performing Arts in January. He said city students will be invited to attend the winter concert expected to take place in the second week of January. “I feel like I had all the love and support,” said McDonald. Some of the love and support manifested itself in the large number people who took pictures with the talented performer. This girl is going to be a powerhouse on Broadway some day. Mark it.